Plate 15 from the fifth set of Thomas and William Daniell's 'Oriental Scenery' called 'Antiquities of India.' Chainpur is a small town in west Bihar where the best sepoys of the East India Company used to be recruited from. The print shows the funerary complex known as the Rauza of Bakhtiyar Khan. Its wall is covered with stucco roundels and motifs typical of the 15th Century Sultanate style. It was wrongly identified by the Daniells as an idgah, an open prayer hall. 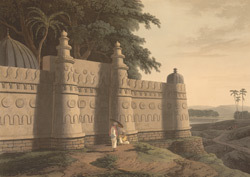 The print shows one side of the walled compound with a tomb structure inside covered by a dome.